Now that summer and hot temperatures are among us, the last thing I want to be doing is cooking in a hot kitchen! Both the oven and the stove top have been forced to take a mandatory hiatus in attempts to keep the rest of the house cool. Instant Pot Corn On The Cob – cooked in just 3 short minutes! No baking, no frying, and definitely no boiling! That leaves me with two options – grilling and using my Instant Pot to make all meals. Although it is hot outside, I prefer to grill most of my food in the summer. Both meat and vegetables get thrown on the gas grill for a quick and easy meal during most nights. However, when those pop up thunderstorms arrive unexpectedly, cooking on the grill gets put on hold. This is exactly what happened last weekend. I had prepped the All-American meal. Hamburgers, hot dogs, instant pot potato salad, and corn on the cob. We were all ready to head outdoors and the skies began to turn black. The grill was already preheated, so I knew we had time to grill the hamburgers and hot dogs. However the corn on the cob was a different story. We didn’t have enough time to get it all done. That is when I turned to make Instant Pot Corn On The Cob. Corn on the cob placed on the trivet with a little milk, water and butter. I shucked the corn, added a little milk and water to the bottom of the pot, and stacked the corn on the trivet. A little butter went on top and the timer was set for 3 minutes. Yes, just 3 minutes on high pressure, and the instant pot corn on the cob was perfect! Perfect corn on the cob to me means the kernels are tender, yet firm enough to provide a little crunch when you bite into them. 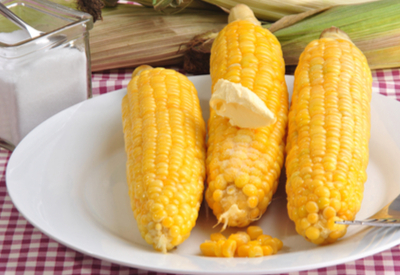 If you like your corn to be softer, then add 1-3 more minutes of cooking time. 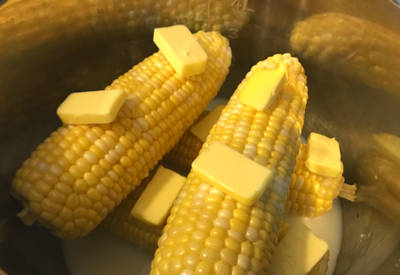 And another benefit about making Instant Pot Corn On The Cob – no need to worry about scalding your mouth with hidden boiling water between or in the kernels! 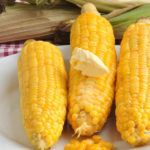 Corn on the cob made in minutes in the Instant Pot. Add water and milk into the liner of the Instant Pot. Add the trivet and place corn on top, layering in a criss-cross pattern. Sprinkle the corn with salt and add pads of butter to the top of the corn. Secure the lid and place the valve in the sealed position. Cook on High pressure for 3 minutes. Carefully perform a quick pressure release. Remove corn from pot and drizzle liquid over top of the corn for added flavor. Season with additional butter and seasonings of your choice. You can add as many ears of corn that can safely fit into your Instant Pot.